Kids and fans alike can imagine the biggest battles and missions in the Star Wars saga with Star Wars The Black Series Zuckuss 6-inch Action Figure - Exclusive! With exquisite features and decoration, this series embodies the quality and realism that Star Wars devotees love. A Gand bounty hunter, Zuckuss heeded the Empire's call for mercenaries to locate the Millennium Falcon and bring her fugitive crew to justice, receiving his orders on the bridge of Darth Vader's Super Star Destroyer. This 6-inch-scale Zuckuss figure is carefully detailed to look like the character from The Empire Strikes Back. This figure features premium detail and multiple points of articulation. Ages 4 and up. 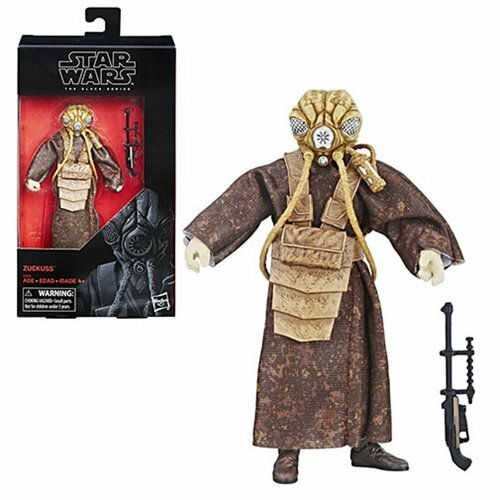 Zuckuss Is Back in Black Series!